To update your credit card or personal information in your ActBlue Express Donor Profile, you should first start by signing into ActBlue. Just head over to https://secure.actblue.com/ where you’ll see a blue “Sign In” option in the right corner of the screen. Click there and you’ll be brought to a page where you can enter the email or password associated with your account. Once you're signed in, click on the blue icon of a person in the navigation bar at the top of your page to open the User menu. 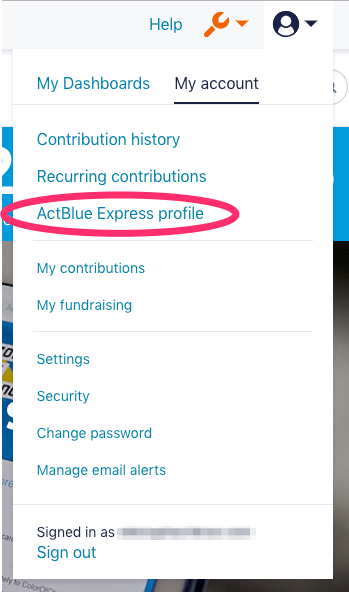 Then choose “ActBlue Express profile” from the dropdown. You can then edit your personal information, including your address, contact information, or preferred credit card options. Updating your credit card information in your account will not update the payment information on your recurring donations; these must be updated separately. We’ll explain how to do that in the question below.